The Letters of the Living, lithograph. Edition of 27. 35cm in diameter. are sharp lines on the white-cream colour of the paper. Made in Sjra Marx's Print Studio, Maastricht, The Netherlands. 10 prints are in private collections. These drawings were originally for an installation of 19 flags made for the 1996 Oerol international arts festival. That year´s theme was magnetism, and I chose a period of nineteenth-century Iranian Bahá'í history as my starting-point. The first 19 followers of this religion took great personal risks, in leaving an established religion to become part of a newly emerging one to follow the Báb (meaning The Gate or The Entrance). As I worked on these drawings, I realised that uncertainty, restraint and alienation were as much a part of any quest as desire, passion and conviction. So these drawings and flags became the result of my own quest to express the magic, attraction, uncertainty and challenge of the spirit. 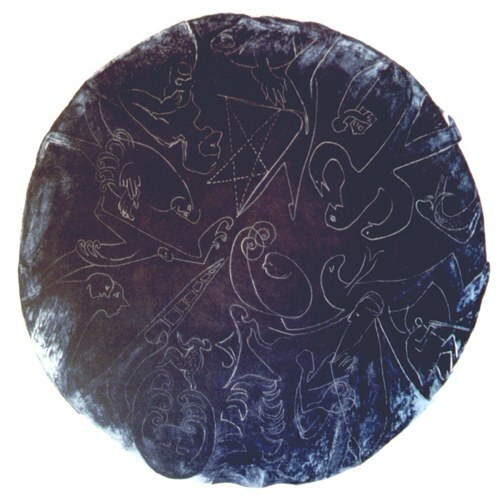 The dark circle is not only a reference to sufi mysticism but also a symbollic 'sky' (heavenly or spiritual realm) for the constellation of 'letters' (apostles) of a new alphabet (religion).